From an Article By Chang Reynolds. 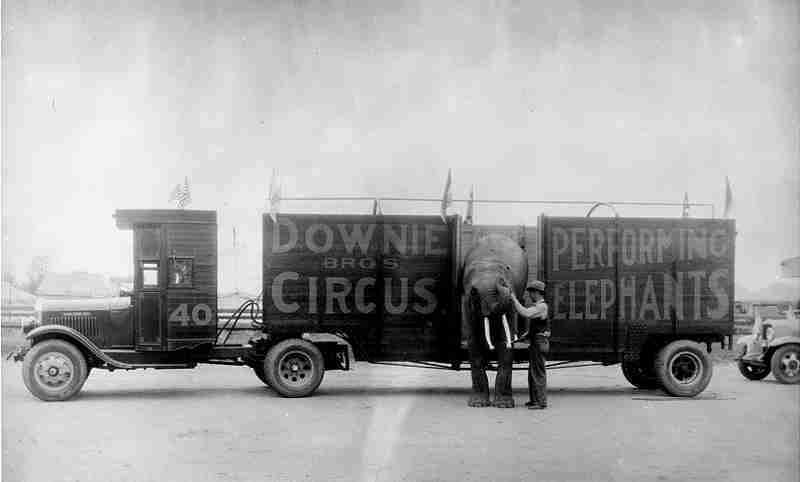 Despite the skepticism of experienced circus professionals regarding the problems of transporting a circus by truck, Andrew Downie, during the spring months of 1926, hurriedly framed a motorized circus with plans for a tour that would take the show into New Jersey, New York and Pennsylvania. 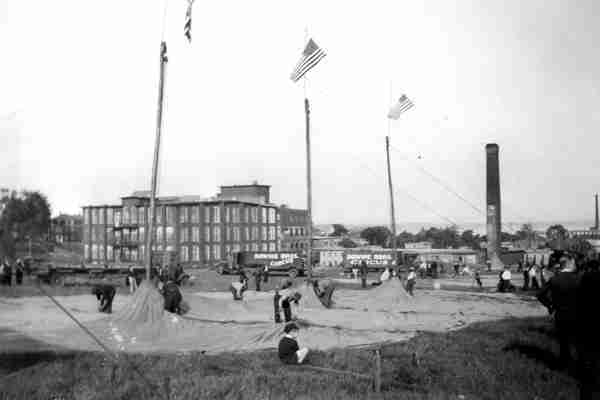 Quarters for the show were selected in the baseball park at Havre de Grace, Maryland, and, although the failure of others in the field of motor transport caused Downie to be wary, he still framed the show within ninety days. "- it is the quickest show, I guess, that has ever been organized," stated Gov. Downie, but so elated was he with its success by the month of August that he vowed he wouldn't accept a railroad show as a gift. By the end of the season this famous owner was planning to enlarge the show for the next year and was stating that the motorized circus was not only practical but profitable. In addition, he was predicting that other circus owners would soon follow in his footsteps. "You can say that the show was made up of men with railroad experience," states Capt. Frank Phillips, who left the Sells Floto Circus after its stand in the Chicago Coliseum to join the Downie show. "There wasn't a mud-show man on the lot. We learned the hard way." This statement, by a qualified observer, no doubt explains the shifting of personnel during the first weeks of the tour, and also indicates the ability of the men who remained to apply their skills at moving railroad shows to the new field of truck transportation. 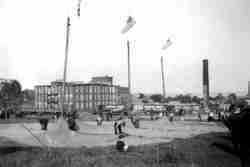 The show was transported on thirty-eight trucks, five trailers, three tractors and three advance trucks at the opening date. The three trucks used ahead of the show housed five men in each and were under the direction of General Agent, Jerome T. Harriman. One truck billed the towns on the route and the other two covered the surrounding country. All baggage trucks were painted red with gold and silver trim. The rolling stock was collected from many sources from anyone who would sell a truck according to Phillips. The calliope for the show was built by Mr. Joe Ori of Newark, New Jersey. A consultation with Joe Bradbury and Bill Woodcock brought out the information that Mr. Ori constructed several for the Ward Baking Company. However, Woodcock thinks that Ori built only the calliope, not the truck body. Bradbury suspects that a truck body builder worked closely with Ori since the decorations on the baking company truck and the Downie calliope are identical. The calliope has some scroll work around the title which reads, "Downie Bros. Shows." It carries a skyboard with the lettering. "This Afternoon and Evening." Above the title are the words "Admission 25 & 50." The truck is, perhaps, a Dodge. The two light plants were mounted on an obsolete fire truck purchased from the Havre de Grace Fire Department. "The trucks were all junk," comments Frank Phillips. "Downie got them from everywhere. I drove a Reo truck - the model that had the gas tank mounted in front of the steering wheel. In the truck I carried the lion act, the arena and my arena props. The thing caught fire every day." When asked about Downie's frequently repeated statement that the show never missed a performance or a meal all season long, Phillips replied, "We never missed a performance, but I guess some of us missed a meal occasionally - at least the working people did. There were many breakdowns with that equipment on every move. Anyway, we started the 1927 season with all brand-new Chevy trucks." The show opened at Havre de Grace, Maryland, on April 24, with ideal weather during the morning and afternoon. The new big top, built by Driver Bros., was filled to capacity for the matinee. However, as the side show opened for the night's business a heavy rain and windstorm hit the town and kept the evening attendance to a minimum. Although the program for the opening date is not available, the staff at that period consisted of Andrew Downie, Owner; James Heron, Assistant Manager; Jerome T. Harriman, General Agent; William B. Emerson, Treasurer; Harry Allen, Legal Adjuster; Jack Croake, Supt. of Tickets and Purchasing Agent; Tex Cavanaugh, 24-Hour Agent; Archie Silverlake, Equestrian Director; W. Wiggins, Advance Banner Solicitor; Henry Bushea, Supt. of Concessions; Charles Lewis, Supt. of Dining Tent; Steve Roberts, Supt. of Canvas; Blackie Collins, Supt. of Tractors; Joe Gilligan, Master Mechanic, and Jack Fahah, Supt. of Properties. The side show, under the direction of Supt. Jake Friedman, featured the Heron's Pit Show, "Jungleland." It was managed by Joe Gilligan and Vernon Ott was the inside lecturer. The candy stands were supervised by Mrs. Marie Heron, assisted by Mrs. Jack Croake. Harry Wellington operated the outside stand and the inside butchers were Joe Coob, James Johnson, William Grebb and Walter Middleton. Fred Brad handled the novelties and Herman Blotner was in charge of the lunch stand and privilege car. The show had one elephant at this time. The bull was Teddy, a young male, that had been obtained from Toy Town, at the New York Hippodrome where he was on exhibit with Rosa's Royal Midgets. Brought to quarters early in April he was trained by N. W. McKay, the elephant trainer for the show. Later, when Frank Phillips was Superintendent of Elephants, Teddy was trained to do a head-carry. Billboard notes that Andrew Downie had purchased three more elephants which were to arrive at an early date. However, with the exception of the delivery of Tena, a punk, at Carbondale, Pa., the records do not indicate that there were others on the show this season. The next elephant to be added to this show was Babe, another youngster, that may have been on the show late in the season and was certainly present for the 1927 season. Present day elephant sympathizers will remember Babe of the Clyde Beatty Circus and Tena, still with Al G. Kelly-Miller. Capt. 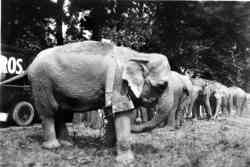 Phillips reports that Teddy, Tena and Babe were the Downie elephant herd until 1930 when Pinto and Queen were added from the Cole Bros. show. Until the head-carry gave him a concussion, Frank supervised the antics of these five bulls. Later, probably during the winter of 1932-33, Addie (Hattie), Cora, Inez and Marion were added. When Andrew Downie came out of retirement in the winter of 1925-26 to launch his new circus, he was a veteran of over forty years in show business. He had joined with Clarence Austin in 1884 in a one-ring venture entitled, "The Downie & Austin Parlor Circus," after several years as an acrobat, wire walker and juggler. At that time he was just over 20 years old. 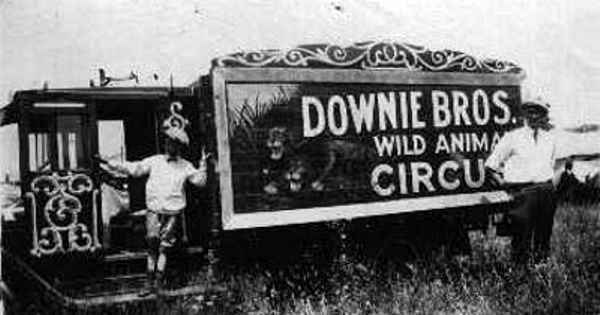 For several years he piloted such organizations as the Rich & Downie Circus, Andrew Downie's Dog and Pony Circus, Downie & Gallagher, and Downie & Wheeler. 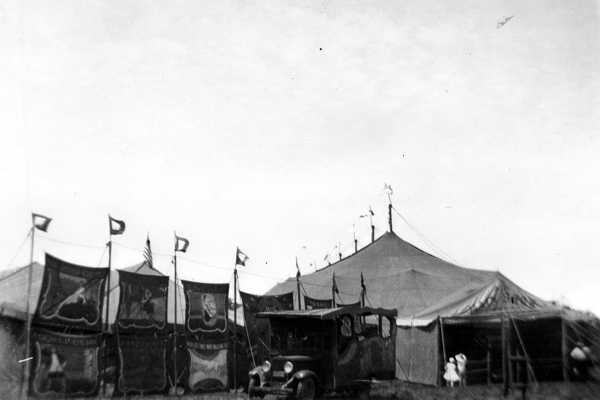 Other show activities during the years before 1914 included the ownership of the Diamond Minstrels, a circus tour by barge of the towns on the Erie Canal in 1892, a tour of Canada from Winnipeg to the Pacific Coast with his repertoire company, and executive posts on the Great Wallace Circus. 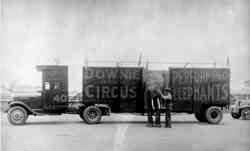 Although Downie married Christena Hewer (M'lle La Tena) in 1890, he did not operate the circus by that name until 1914 when he opened with a 10-car railroad show entitled, "The La Tena Wild Animal Circus." In 1916 this show was increased to fifteen cars and Downie returned to his Canadian homeland for part of the season's route. This show folded without warning in 1917 at Havre de Grace, Maryland, but Downie leased the Walter L. Main title the following winter and was on the road with it until the end of the 1924 season, when he retired. Miller Bros. took possession on October 25, after the final stand of the season. Col. Joe Miller had been with the show since the sale was consummated in September. Downie had passed his 61st birthday in August of that year and undoubtedly felt that a rest from the strenuous life was in order. However, he was away from the circus one season only before developing the motorized circus that was to become one of the favorite shows of the eastern states under the management of Downie, and, after his death, Charles Sparks. 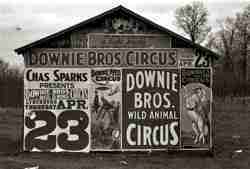 The new circus opened the 1926 season bearing the title, "Downie Bros. Motorized Show," and was usually referred to as the "Downie Bros. Circus." 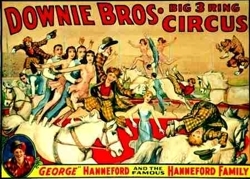 Several titles were used during the season as Billboard notes on July 10, that the title had been changed to "Downie Bros. Wild West Circus," and in the July 17 issue carried an advertisement requesting musicians, cooks and side show personnel to report to "Downie Bros. Animal Circus." The Express, of Dansville, N.Y., advertised the arrival of the "Downie Bros. World Best Shows" for June 30, 1926. Subsequent to the Medina stand, July 5-12, nearly all advertising used the title, "Downie Bros. Wild Animal Circus." After the Saturday opening date, the show moved to Elkton, Maryland, for its first stand of the tour. The balance of the first week took the show to Oxford, Pa.; Bel Air, Md. ; Red Lion and Stewartstown in Pennsylvania, and back to Cockneysville, Md., for the Saturday stand. The runs for the shake-down week varied from ten to forty miles each day and the show was moving as smoothly as could be expected. The second week opened at Reistertown, Md., with Emmettsburg in that state the Tuesday date, followed by Waynesboro, Mercersburg, McConnellsburg and Bedford, all Pennsylvania dates. Keyser, West Virginia, opened the third week with Cumberland, Md., the Tuesday stand, and Meyersdale, Berlin, Boswell and Ebensburg, Pa., concluding the week. The fourth Monday, May 17, the Downie show opened a solid week of stands in Pennsylvania with Hollidaysburg, Huntingdon, Burnham, Middleburg, Salins Grove and Millersburg filling the week. During the fifth and sixth week, the show continued its tour of the Quaker state with Tower City, Tremont, St. Clair, Frackville, New Philadelphia and McAdoo, the stands of week number five and Freeland, Weatherly, Nescopeck, Shickshinny, Exeter and Olyphant receiving engagements for the sixth week.